Hey everyone! My boyfriend and I recently booked a little staycation in our hometown of Minneapolis. Sometimes it's nice to "get away" even if it's only 30 minutes away. There are so many things to do in downtown Minneapolis that we are always finding new places to go and new food to try. I wanted to check out a new hotel that we had never stayed at before. I checked out some reviews on Hotels.com and TripAdvisor to find some nice, romantic ones (that also don't break the budget...), while also being really cool and modern. I stumbled upon Hewing Hotel in the list of potential candidates, and after taking a browse through their website, it looked like exactly what we were looking for. The hotel is actually a renovated warehouse built in 1987. The hotel's name is inspired by the giant pine beams that are everywhere in the interior of the hotel. The beams were logged in Minnesota and floated down the Mississippi river to the mills just down the road. Even in our own hotel room there was a really cool pine beam next to the bed that made it feel really rustic. Hewing Hotel also features Tullibee: A unique North Loop restaurant and bar inspired by Minnesota's lakes and woods. As such, the menu is strongly influenced by Scandinavian cooking. The hotel also features a 24 hour fitness center, a year-round rooftop bar, sauna, and spa pool. 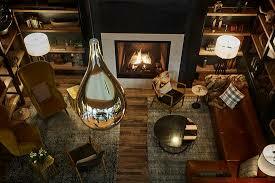 The lobby was equally as extravagant and warm and cozy with a roaring fire in the fireplace. Our hotel room! You can see the pine beam at the base of the bed - very cool! We wondered out to Red Cow in Minneapolis for a bite to eat, but I really wanted to head back so we could relax on the big, comfy KING sized SERTA mattress and under the cozy duvet. And relax we did! I think we didn't even leave the bed the entire rest of the night. I was so sad to check out the next morning because it was such a nice hotel and we just had the best, most relaxing time. I can't wait until our next staycation because this place will definitely be on my list of places to go! Thanks Hewing Hotel for your lovely hospitality! 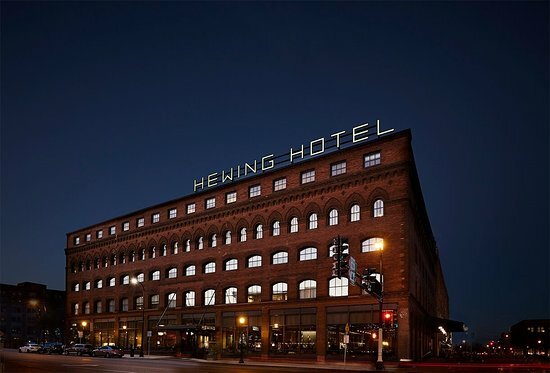 If you would like to check out Hewing Hotel, go to their website to find our more information on pricing and amenities.